Roof climbing is a phenomenon that is widespread almost exclusively in St Petersburg. Russia’s northern capital is ideal for roof climbing. It is greatly helped by the fact that the city's historical center is so compact. In any other city, climbing from one roof to another would be more of a challenge. Roof climbing is a pastime that has many followers in Russia's northern capital. It is, of course, practiced in other cities as well, but only in St. Petersburg can one freely navigate the space between the ground and the sky. This is why there are already some 10,000 roof climbers in the city. For them, it is no longer just a hobby but a way of life, a symbol of freedom, and a good way of overcoming stress. There is no need to go to Goa to get a break from the corporate world. All it takes is a bit of skill, nimbleness, and courage, and you can become an elf, if only for five minutes. “Concentrate, watch your feet. Use your entire foot, to increase traction,” Andrey Dubrovsky instructs me softly. It is, of course, easy for him to say all this since he has been on this roof a countless number of times. How does he expect me to watch my feet when right above us, right above our heads, looms St. Isaac's Cathedral with all its architectural and historical might? Generally speaking, I am not a fan of St. Petersburg. It is just a museum built on a swamp. But this time something stirs inside me. It seems you can touch St. Isaac's Cathedral with your hand. It is, of course, an optical illusion. But what an extraordinary illusion! From here, the whole of St. Petersburg is on the palm of your hand. It is a completely different city that you see from here. Its angularity is gone. Its geometry is softened. It's like a smart jacket turned inside out. And suddenly you find that it can be comfortably worn that way too. The Hermitage is no longer oppressive with its excessive monumentality. From the height of a seven-story building, the Admiralty needle is not quite as arrogantly sharp either. Far away, you can hear seagull shrieks and the chants of Zenit football fans. Zenit scores a goal against Bayern Munich. Yet, Dubrovsky does not even turn his head towards the Petrovsky stadium. Here, on a St. Petersburg roof, discussing a mundane topic like football would be considered bad manners. Roof climbing is a lofty pursuit, in every sense of the word. There are five of us here: Andrey Dubrovsky, Bulat, Maxim Nikonov, photographer Alexei and myself. Five is a bit too many. Roof climbing is not a mass activity, and is better suited for loners. There is a stereotype that a roof climber cannot exist without a camera. There is some truth in it. Many climb the roofs in order to take pictures of St. Petersburg. Some have made it a part of their lives. They take pictures of the city from the same spot in different seasons, at different times of day or night, in different weather. Some even say, “I won't be climbing today, I've left my camera behind.” Those for whom roof climbing is a creed despise this point of view. They maintain that a good roof will always forgive you if you don’t take a picture of it. Seeing roofs as animate objects is yet another trait typical of roof climbers. Nikonov has never been thrown down by a roof. Dubrovsky's experience is different. Once he tried to climb up to a roof on a wet day, slipped, and began sliding down. Trying to hold on to something, he hurt his hands. Luckily, the roof was being repaired at the time and one of the workers saw him and managed to catch him. It was a migrant worker, from Tajikistan. After that incident, Dubrovsky has become a champion for ethnic tolerance. Roof climbers seldom have any problems with the police. There was only one incident that members of our group could recall. Two Russian climbers and a Danish friend of theirs, a photographer, were out on the roofs. One of the residents of the building saw them and called the police, who arrived soon. As luck would have it, at the time there were news reports about a congress of exiled Chechens led by Akhmed Zakayev being held in Denmark. The Danish photographer was suspected of espionage and his Russian friends of assisting him. However, a FSB [Federal Security Service] officer arrived soon, took a close look at the three people's faces, and let them off with a warning, without even checking the pictures they had taken. Every proper roof climber in St. Petersburg must have acquaintances, whose help could come in handy. Dubrovsky has many of them, and this has enabled him to get access to roofs that have not been visited by many of his peers. He managed to climb the roof of the Astoria Hotel, since his girlfriend’s father works there, as a security guard. I am offered the privilege to climb to one such premium roof. It is above the studio of Viktor Tikhomirov, a prominent artist and a friend of Dubrovsky's. The studio must have been an attic in the past. There is a hatch leading from the room straight to the roof. You open the window and you are there. The famous Church of the Savior on Blood is so close that you can't see all of it through the window. I put my leg through the window. It feels as if I would step on the church in a minute. Over there, the view is like that of the 16th arrondissement of Paris, and looking the other way, the view is of Venice in spring. Unlike Moscow, where the authorities have occasionally clamped down on the activity, St. Petersburg is ideal for roof climbing. It is greatly helped by the fact that the city's historical center is so compact. In any other city, climbing from one roof to another would be more of a challenge. On top of this, most roofs in St. Petersburg are flat, making them much easier to climb. We are climbing out to the roof of the main building of St. Petersburg University. It offers a breathtaking view of the Neva. I should be overcome by esthetic bliss. And yet, as a Muscovite, all I can think of is why someone doesn’t set up a café here, called Karlsson-on-the-Roof? Or put up an advertising banner over there, near the big road? 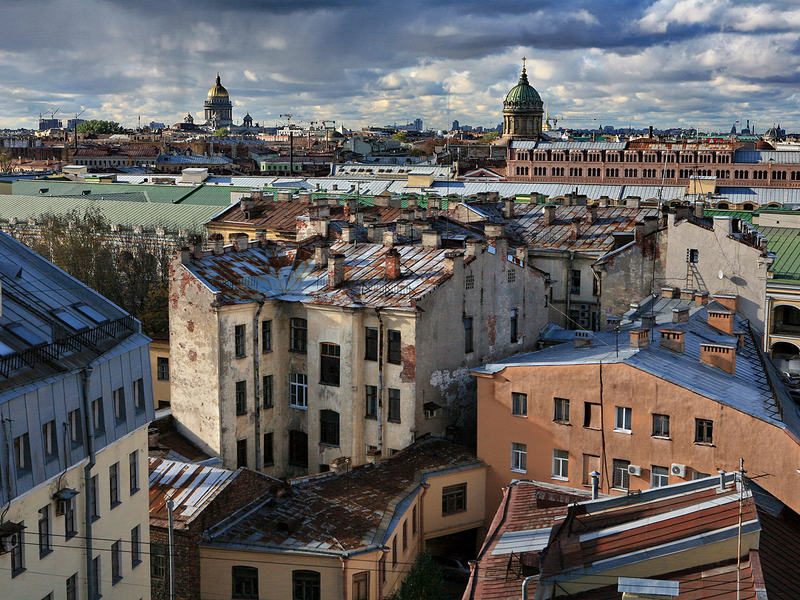 According to some estimates, there are about 10,000 roof climbers in St. Petersburg. Those who are not involved in this activity have no idea that there is a whole life up on the roofs. In addition to photography, roofs are ideally suited for dating; there is no better place to win a girl's heart with. It is also a great place for meditation. Or for having a glass of wine or a beer, nothing stronger. There are organized tours of roofs. It is also a place for meeting new people. To climb a standard St. Petersburg roof in the center of the city takes a certain amount of training. Staircases in St. Petersburg are a test for any cardiovascular system. Those who climbed them will know what I mean. Elevators are virtually nonexistent. And even when there is one, it is usually very small. Each self-respecting roof climber in St. Petersburg has roofs “of their own, which offer stunning views. They share these roofs with their family and friends. They share keys and code combinations. They don't take there people they don't know or trust up there. Some, in a fit of selfish possessiveness, even put their own locks to the doors leading to their favorite roofs. This is something that is frowned upon in the roof climbing community. Nikonov does not have a dream. He is quite content with the roofs that are already open to him. He, however, does not reveal the exact addresses of his favorite roofs. Roof climbing is a spontaneous movement, and there is no organization behind it. Enthusiasts communicate mainly through the Internet. They form small autonomous groups. Often, they only know each other online, although sometimes they meet in the At the Stone Bridge cafe. Yet, it would be wrong to describe it as their meeting point. Everything is spontaneous, and there is nothing that resembles a sect here. There are no offices, like those that hitchhikers have, and no membership cards.